On the first day of quail season Plato, the Bird Dog, is missing. At first, Hank is willing to let him stay lost. But when Beulah pleads for help, Hank caves in and takes off in search of Plato. 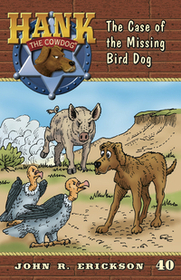 Before he can catch a scent of the spotted bird dog, he finds himself face-to-face with an angry mother hog and her litter. Can Hank’s quick wits help him out of this fix? Or will he become hog meat?